Love a red carpet? Let us roll it out for you! Register as a ZIP (ZaZa Important Person) and be rewarded. Free nights now come with $50 Hotel Credit per stay! Any dollar amount offered in the form of Restaurant or other Hotel Credits is offered in association with a reservation on a per stay basis and not linked to a membership profile. Restaurant or other Hotel Credits offered must be consumed during the eligible stay, have no cash value and are non-transferable. No balance forward will remain on the Member profile after the reservation departs. ZaSpa offers for ZIP are not combinable with other offers. Discounts must be applied prior to service at ZaSpa reception. ZaSpa offers for ZIP are only applicable during qualifying stays. Membership verification may be required. Preferred rates are available for eligible reservations booked directly with Hotel ZaZa. Preferred rates may include a percentage off our Daily rate or a percentage off overnight accommodation packages. Login to your account online to gain access to preferred rates or inquire with a ZaZa representative at the time of booking. Preferred rates may not be combined with any other offer. Promotional rates, special offers or packages may not be combined with other select promotions, offers or discounts and cannot be applied to any existing reservations. These rates are based on availability at the time of the request and there are a limited number of rooms available for this promotion. Blackout dates may apply. Preferred rates are per room, per night, may be based upon a certain room [and length of stay] and modifications may not be allowed. ZIP Preferred rates are not available for groups and cannot be combined with negotiated or contracted rates. ZIP Preferred rates may be subject to other restrictions communicated in the rate rules for each reservations. ZIP Members may retrieve folios from past stays by logging into their account at www.hotelzaza.com/loyalty. ZIP Members may also manage their account profile, preferences, points, reservations and stays while logged in. In order to be eligible for ZIP express check-in, new members are required to swipe a credit card upon arrival of their first stay after registration. All members agree to inform Hotel ZaZa of any credit card updates, changes, or cancellations to the card originally swiped. All members agree to use this swiped credit card on file to authorize express check-in and to settle all charges for the stay. If the originally swiped card cannot be authorized for estimated charges for the entire stay (room, tax, and incidental charge estimate), the guest will not be eligible for express check-in until the method of payment has been updated with the front office staff. ZIP members are invited to select their complimentary welcome amenity by logging into their account at www.hotelzaza.com/loyalty or by informing a ZaZa representative. Complimentary welcome amenities to choose from are subject to change and based on availability. Members may change their selection at any time. The amenity is delivered to your room on the day of arrival on eligible reservations. Complimentary welcome amenities are limited to 1 per stay. Every attempt to deliver the welcome will be made based on a member’s arrival time, do not disturb signs will be respected. ZIP Points are accumulated on a per-night basis and awarded 2 days post departure for stays departing on or after 7/1/17. Stays prior to 7/1/17 will be carried forward with one stay equaling 1 point. Stays prior to an individual’s enrollment for ZIP Program are not eligible for ZIP Points. ZIP Points can only be accumulated on a single account per stay and only by the account number that is attached to the reservation and to the primary name on the reservation. ZIP Points expire on the last day of the 36thmonth after they were awarded. ZIP Points have no monetary value & requirements or basis for accumulating ZIP Points are subject to change without notice. ZIP Points may be redeemed at any current or future Hotel ZaZa location in exchange for free overnight accommodation on a nightly basis. Quantity of ZIP points necessary to redeem free nights may vary based on location, room type selected, is subject to availability and membership status. Black-out dates apply. ZIP Points cannot be redeemed retroactively. Member must request to redeem ZIP points prior to or at check in. ZIP Points have no monetary value, are non-transferable and cannot be exchanged or combined with any other offer. Reservations booked direct at www.hotelzaza.com or with a ZaZa representative are eligible for ZIP Benefits with the exceptions of those made within a group block (i.e. wedding or holiday party) which are ineligible for ZIP Benefits. Brokering of rooms will not be permitted and are ineligible for ZIP Benefits. Please ensure you are logged in to your account before booking or ask a ZaZa representative to ensure your account is associated with your reservation at the time of booking or at any point prior to your arrival. Reservations made through a third party vendor, including but not limited to the following: Expedia, Travelocity, Hotels.com, Priceline, Tablet Hotels, Orbitz, Booking.com, TripAdvisor, etc. are ineligible for ZIP Benefits. 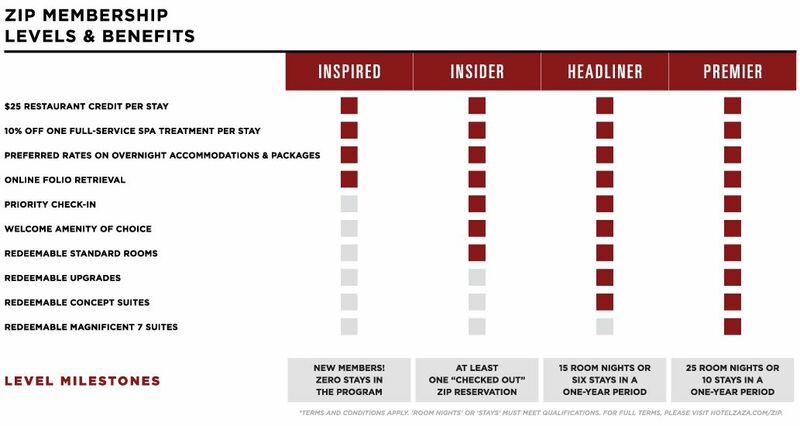 Membership Levels are reached based on eligible reservation activity after member enrollment that may encompass number of stays or number of nights stayed within a specified time period. Renewal or downgrading of level is based on eligible reservation activity. Each Membership Level may be eligible for different benefits. By enrolling in the ZIP program, you are opting into receiving marketing communications from Hotel ZaZa.